On a trip back to Wukro town in the Tigray region of Ethiopia this month, I am amazed at the transformation. Our last visit took place in the middle of a drought. The landscape was brown, with many fields tilled, waiting for the rain. But this time the fields are a patchwork of lush greens of healthy tef, wheat and millet crops. Reservoirs are full, where previously there was only bare, dusty ground. The river, which was bone dry, is not only flowing now, but is a hive of activity as people bring themselves, their clothes and bedding, their vehicles and livestock, down for a wash. This amazing change is also notable for the absence of queues for drinking water. When we visited in February the water utility was operating a ‘shifting system’, opening a very limited number of valves at different times of the day and week, so that everyone received a share of the very meagre amounts of water available. This meant that households would get water for one hour a week, sometimes in the middle of the night; and this water arrived in a trickle allowing them to only fill one jerican. People had to resort to other water sources, walking farther and paying more. Fast forward to September, the water from the piped system is back to the usual standard of water for two to three days per week. Not a perfect system, but better. 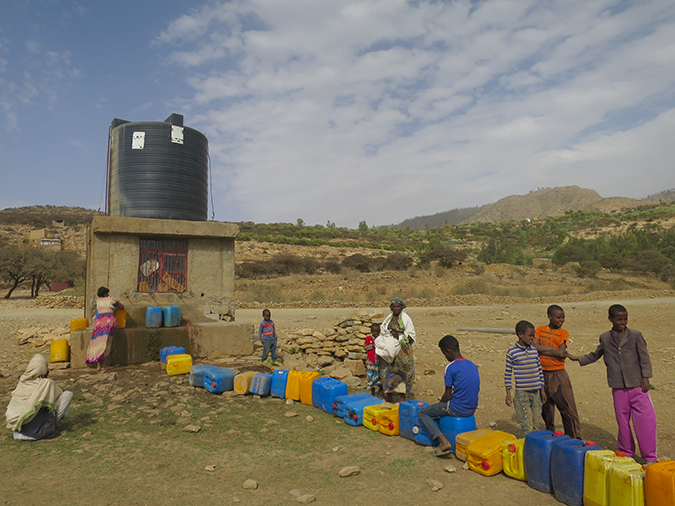 In the surrounding rural areas, the queues of jericans at each handpump and rural water point are nowhere to be seen, as are the teams of children who carried them and pumped the water. Water points are deserted; everyone seems to be at the river. But the earlier drought didn’t just impact on drinking water. Food was also less available as many of the local crops failed. We saw people bringing their livestock down to the dam for a drink. Women working in the market were spending longer and travelling further to buy produce to sell. These changes in the way people access and use water, how they experience water security, were especially of interest to us. Improving water security is about reducing water-related risks, but these risks don’t just come from the water, which can be measured in terms of quantity and quality. These risks are influenced by the choices people make, choices made on the basis of economics, time, convenience and tradition. And they affect all aspects of people’s lives. Home to 42,000 people, Wukro is the location for REACH’s observatory on ‘Small town pathways to water security’ where we’re studying the changes in water security as UNICEF implement a Water Supply, Sanitation and Hygiene (WASH) programme, to provide lessons for other small towns in Africa. When the impact of WASH programmes is measured, the focus is often on changes to the main source of water used, and the quantity and quality of water obtained. In contrast, our water security approach aims to understand how people make their decisions about which water source to use, and how this changes with water availability and with the evolving water services. During the wet season the fields outside the town are verdant, and the water storages full. The river that was dry previously is now a hive of activity for work and play as people make use of the availability of water. This reservoir was almost empty, but is now full again following the return of the rains.